Lighting, grip, and camera support gear available for rental in Northwest Arkansas. For a quote, email hello@forge.film with your filming dates. On some items we require a rental insurance certificate (COI). Unless otherwise arranged, pickup/dropoff will be in Siloam Springs, AR. Scatterbox mounts to v-mount plate or 15mm back rods to power a camera and accessories. Provides regulated (2) D-tap, (3) 12v 2-pin lemo, (1) Fischer 24v 4-pin lemo. Takes V-mount batteries (and AB batts via included adapter). Can also mount Scatterbox directly onto Anton Bauer camera plate via adapter. Teradek Bolt Pro 300 wireless TX/RX SDI kit. Includes transmitter, receiver, (2) D-tap power cables, (1) AC adapter, and (2) SDI cables. 100mm Sachtler Video 18 head with aluminum sticks and ground spreader. Rock solid and smooth, sticks can also support a lightweight jib. Comes in hard case. Zacuto VCT baseplate, tripod receiver, 15mm rods, shoulderpad, handles, Zamerican arm and Zicro mount for monitor/accessories. Mini-tripod / Hi-hat with 100mm bowl and flat-mount for your head, rated to 200lbs. Libec head rated to 20lbs, plate, sticks with 75mm bowl, ground spreader, optional mid level spreader, soft case. 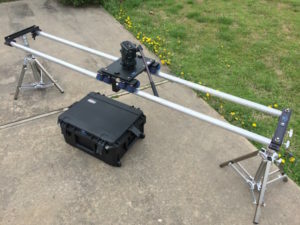 A robust slider kit. Includes 4ft and 8ft speed rails, slider stands with optional caster wheels, center support, and anti-tip brackets. Kit includes 75mm, 100mm, and 150mm bowl adapters for your tripod head, and the dolly packs neatly into a rolling hard case. Tripod head not included. RØDE NTG3 shotgun microphone, RØDE Blimp windshield & “gun” handle, 15-ft XLR cable, Ktek Boom, boom-mate stand adapter, (2) wired XLR lav mics, and Tascam DR40 audio recorder. Includes (1) 32GB card, (2) Canon LP-E6 batteries, (1) charger. Can also be configured Magic Lantern and a 500GB card. Ask for details. 90wh v-mount lithium-ion camera batteries w/ (1) built-in D-tap. Kit includes (4) batteries w/ a 2-position charger. Kit includes (3) 90wh Blueshape BV90 batteries and a 2-position charger. Batteries have two D-tap outputs directly on batt. 8ft Avenger fold-out frame with 1/4 silent Grid, Full silent Grid, and Black Solid/White Ultrabounce rags. 24″ x 36″ flags – (2) Solids, (1) Single net, (1) Double net, (1) Silk, (1) open gel frame. Gel frame can be pre-strung with diffusion gel on request. (1) 4x4" white/silver beadboard, (1) 2x3 white/silver beadboard, (1) quacker clamp, (1) 4x4 Gel frame w/ 410 Opal Frost, (1) 4x4 Gel frame w/ 250 diffusion. MSE C-stands with arm, grip head, and 15lb sandbag. (5) 40" stands and (1) shorty/coleman stand available. 25ft stingers w/ standard edison plugs and a tri-tap splitter. (5) available. (2) MSE Road Rags frames, (1) silk diffusion, (1) solid flag, (2) nets, (1) silver reflector, and Mini Grip kit with (2) arms and heads. These are fully-manual vintage lenses with a Canon mount. They have a beautiful character, a soft-contrast cinematic look that catches flares and smoothly rolls off highlights. They will cover a full-frame image circle. Each has a Canon mount, de-clicked aperture, standard-pitch follow focus gears, and 80mm OD front (with 77mm internal filter thread). The set comes in a hard Pelican 1510 case and can be shipped. Fits any Canon DSLR, C300, C100, or RED camera equipped with a Canon EF mount. Rental can also include a high-quality MTF EF-to-NEX adapter for use with the FS7 and FS5, A7S line, or FS100/FS700. Canon 70-200 f2.8L IS II zoom lens, with Canon 2x EF II Extender. (2) Kino Flo 4ft 4-bank lights. Includes flozier diffusions, control grids, KF55 daylight and KF32 tungsten bulbs, ballasts, head cables, and soft carry cases. (2) 750w Source 4 ellipsoidal lights, with (1) 50-degree, (1) 26-degree, and (1) 19-degree barrel. Includes (2) gel-frame holders, (1) drop-in iris, and spare bulbs. Dimmers available on request. 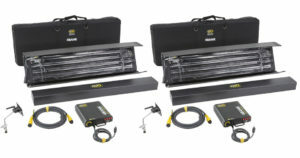 Kit with (2) LED 1×1 lights, diffusors, mounting frames, power cables with AC adapter & dimmer. Flex lights are a 10×10″ panel that is flexible and high output with 95+ CRI color. 5600k daylight balanced. Output is roughly as much as a Kino Flo Diva. Water-based fog machine. Suitable for small to medium size interior spaces. Comes with 1/2 gallon of fog juice. (2) Quasar Science 4ft crossfade tubes. 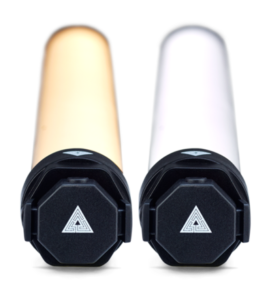 These LED lights offer variable color temperature and high output. Kit comes with tube holder that fits into a standard grip head. These lights are dimmable with any standard dimmer. 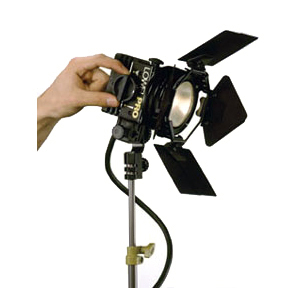 Lowel 250w tungsten light kit, includes (2) lights in a soft carry case. Zacuto Gratical HD Viewfinder with SDI/HDMI input/output/cross-conversion, LUT support, and extensive image and exposure tools. Includes Axis Mini mounting arm, (2) Canon LP-E6 batteries, (1) charger, D-tap power cable, hard case. Convergent Design Odyssey 7Q monitor & recorder package includes 7″ OLED 7Q monitor, (2) 512GB SSD’s, (1) USB3 SSD reader, (1) D-tap power cable, (4) Sony FP-970 batteries, (1) charger, 1/4″ monitor support arm, SDI and HDMI cables, and Pelican 1450 hard case. 15″ OLED 10-bit client or directors monitor w/ 2x SDI inputs and passthru, HDMI input, v-mount plate, sun-shade, carry case, and adjustable c-stand mount. PIP/side-by-side image option, 400 nit brightness. Shoot-through lens glass, hood, 15mm rod mount with adjustable height, universal iPad mount (does not include iPad).